This attempt to make fried donuts was inspired by local Thai and Chinese restaurants. 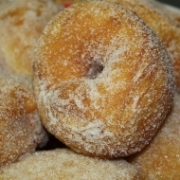 They serve these freshly fried donuts dipped in sugar or sometimes left plain and are served with a sweetened condensed milk and chopped peanuts dipping sauce. My co-worker and friend, Lynn, mentioned seeing them using what looked like biscuits in a can…so I told her I would try them! They turned out great! Heat the oil at medium heat until it gets very hot. Fry biscuits in batches about 2-3 minutes per side until golden brown. Remove with slotted spoon and allow to sit on paper towels to drain for about a minute or two. 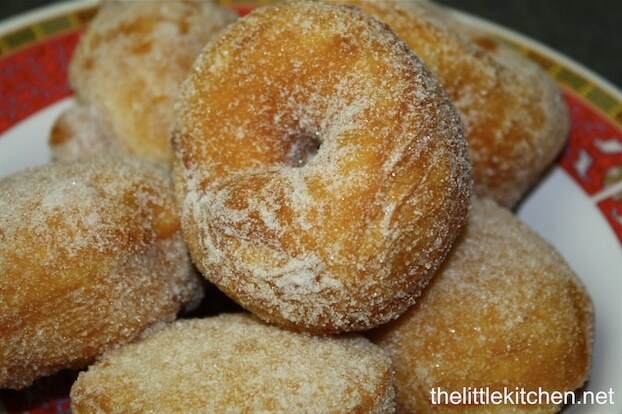 Place one at a time into bowl with sugar using spoon, cover the donut with sugar. Repeat steps 3, 4 & 5 until finished. If you want more donuts and/or would like them not as thick, you can separate each biscuit (there are layered) in half. Some restaurants even cut them in half so they are half circles or even half moons. I used a sauce pan to fry these up. I think I had about 1 1/2 to 2 cups of vegetable oil (about a 2 inch layer) and I was able to fry about 2 to 3 donuts at once. I LOVE easy recipes, especially ones with THREE ingredients! Awesome- sauce! I have made these before, even without the sugar, they are delicious! These little donuts are quick and easy, but with so much taste. Good sweet treat. I would make a glaze for topping. I use powder sugar and add water. Just use your judgement. on water. I made glaze thick. Mom made these and shook them in paper bag of confectioners sugar. Had a biscuit cutter that took out center hole, which made the munchkin size centers. Great on cold days with cup of hot chocolate.